On December 18, 2013 the leaders in the finance and Forex industry were awarded on the ceremony arranged by International Finance Magazine (IFM) in Dubai. This high-profile event is of great importance in the international financial industry; it is noticed by a large number of people. IFM awards honor only those companies which have proved their top-notch performance and made a huge priceless contribution in the development of the finance and trading industry. After considering carefully and evaluating honestly the nominees� profiles, the organizers announced the winners. InstaForex certainly could not avoid being awarded. 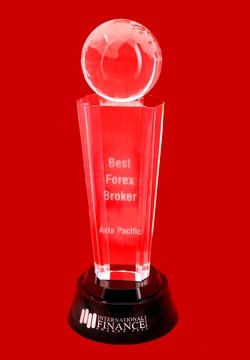 So, the company was picked up as an undisputed winner in Best Forex Broker Asia Pacific category. The honorable duty to get the award was delegated to Shahzad Ahmad, the Director of InstaForex representative office in Dubai. Once again the international broker joined the ranks of the best and proved to be a worthy participant of the Forex market. The award from IFM means that InstaForex was recognized as the most efficient brokerage company that uses groundbreaking technologies, conducts full-scale market researches, and implements up-to-date educational programs. What is more, the company is rendering assistance to clients around the world. IFM award proves that all InstaForex services enjoy great popularity not only among its clients, but also among financial experts and other market participants. Reference: International Finance Magazine is the unique source of information about various financial markets, the latest news, surveys and comments on the most meaningful economic events in the world as well as a vast gamut of global issues presented in the easy-to-understand manner. International Finance Magazine is the financial authority recognized worldwide the judgment of which is taken into account by the whole international community. In early autumn 2013, UK Forex Awards� evening event took place in London, where the winners in different categories were announced. UK Forex Awards is one of the most authoritative award-giving bodies not only in Western Europe but also around the world. According to the results of a verified voting, held among the jury of experienced traders, InstaForex won the Best Forex ECN Broker award. 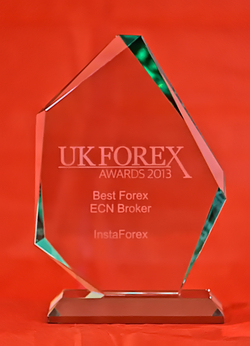 A triumphant win in the category of the Best Forex ECN Broker is another proof InstaForex is on the right track. The broker�s leading positions recognized by top financial experts confirm InstaForex clients and partners� confidence in the company. The Best Forex ECN Broker title is a telltale sign of the broker providing top-notch Forex services that meet modern standards. This award has become the third one in the company�s track record for autumn 2013. 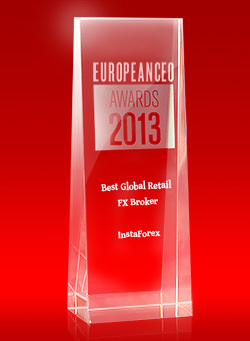 Thus, European CEO Awards recognized InstaForex as the Best Global Retail FX Broker. 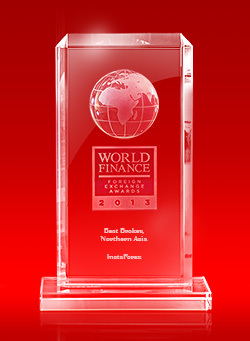 Moreover, InstaForex won the title of the Best Broker in Northern Asia by World Finance Awards. All these achievements are yet more proof that InstaForex products and services are in high demand and acknowledged by customers, experts, and market participants as being worthy. In autumn 2013, European CEO Awards, reputable in the financial world authority acknowledged InstaForex as the Best Global Retail FX Broker 2013. The international European CEO Award was established a few years ago by the European CEO, the popular British magazine about business and economics that specializes mainly in publishing articles targeted at top managers of middle and large-sized European companies. It has been the second time in the award�s history that the judging panel handed over the trophy to InstaForex, thus marking the broker�s deserts and success in retail forex. It should be reminded that back in 2011, European CEO Awards adjudged InstaForex the Best Retail Forex Broker trophy. Now in 2013 as in 2011, apart from InstaForex advances on the retail forex market, the European CEO Awards organizers and judging panel appreciated the company�s contribution to the forex market development as a whole, besides they recognized frequent implementation of new trading technologies. The Best Global Retail FX Broker prize has become the third high-status award for InstaForex in 2013. This underlines the ongoing company�s development affirmed by the independent awards and show events. A great number of awards delivered to InstaForex indicates that the broker�s services are much-in-demand on the market and they are recognized not only by clients, but both by experts and market�s participants. Reference: The European CEO magazine is a distinguished British journal. It is published in Europe and enjoys a sound readership comprising top-managers of medium and large-sized European companies, financial, and economic wizards. The European CEO magazine stands out among competitors by publishing a wide range of meaningful current news and events taking place on the world financial market. The reading audience of both printing editions and online versions embraces over 100,000 people around the world. InstaForex adds another award to its rich collection. In 2013 the company earned the Best Broker Northern Asia under the auspices of an annual World Finance Awards established by World Finance magazine. Over the last two years the broker has gained many awards that single InstaForex out for its financial activity in the Asian region. The Best Broker Northern Asia bolsters company�s solid positions attained in the fastest growing region. Today, InstaForex embraces several tens of offices and Introducing Brokers, hundreds of thousands of clients, advanced affiliate network, and official company�s website available in all Asian languages of the countries where InstaForex operates. Asia is the principle and strategically important partner of InstaForex. Asian economy expands actively due to severe competition on financial market with new services appearing daily. That InstaForex still leads the forex market in Asia is the merit of company�s team and its numerous customers and partners in Asia. Reference: Editorial board of World Finance magazine is composed of the top journalists, analysts, and experts from Singapore and Indonesia to Great Britain and the USA. World Finance can claim large readership consisting of entrepreneurs, financiers, and those who use different financial services. Hundreds of thousands of people read World Finance magazine daily. The competent jury confers awards based on special criteria: innovations, originality, and ability to manage complex projects, level of competence and strong leadership skills as well as reliability and transparency of activity. InstaForex managed to leapfrog other nominees of the Best Broker Northern Asia certifying its impeccable credentials. 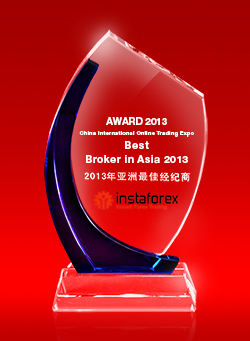 InstaForex was declared the best broker in Asia at the China International Online Trading Expo (CIOT EXPO), which took place in April 2013. It is the 9th time InstaForex has been singled out in the Asian region. It is worth noting that the company has enjoyed the status of the best broker in Asia for five years already. In 2013, the number of the company�s customers and partners ran over 1,000,000. Their firm confidence is justified by high-tech Forex service meeting the modern standards as well as reliable and lucrative trading conditions. The China International Online Trading Expo (CIOT EXPO) is one of the key Forex events in the Asian region attended by world-famous brokers, banks, and other financial institutions. The recognition of the company as number one on the Forex service market is another sign that the broker is successfully progressing and another trophy in its collection of awards.